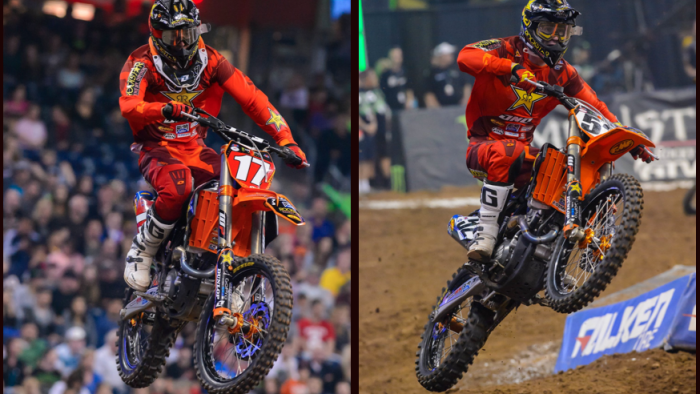 The Rockstar squad made a triumphant return to the 250 West Coast Supercross Championship. After leaving Jason Anderson in San Diego with a 2nd place podium and a slim 4 point lead for the title and heading East, Mr. Anderson picked up right where he left off in dominant fashion. Unfortunately for the team on a sour note however, they had another 450 class rider go down with injury in Cole Thompson. Jason Anderson hasn't raced for several weeks, no different than any of his competition. Of course they have all been riding 5 days a week or more but can still be rusty when it comes time to perform in a packed stadium. Jason started the day a little off with some odd mistakes on the first lap of practice. He rapidly put that behind him, posting the fastest 250 qualifying time of the day, which would have put him in the top 3 in the 450 class overall. Something Anderson has been doing all season. In his qualifier, things didn't go as planned coming out of the gate. He had a bad jump off the line and was shuffled back well outside of the top 5. He quickly moved into 4th by the end of lap 1, then suddenly found his way into 2nd. The rider in first was his main 2014 rival, Cole Seely. Cole was able to secure the victory in the heat but the team had comfort in the fact that Jason came from way back in a short 6 lap race to finish a close 2nd. The main event proved that the #17 is in this to win and is the odds on favorite to take the championship with 2 rounds to go. It appeared that Anderson had the holeshot, but was apparently nudged by Jessy Nelson by a hair. That didn't matter though, as Jason immediately took over the lead. From there he went on to lead every lap. He negotiated the lapped riders successfully and built an early gap over 2nd. Near the end of the race he tightened up a bit and let Dean Wilson get kind of close on the last lap, but the victory was going to no one else. He picked up his 4th win of the year, boosting his points lead to a much more comfortable 11. Jason Anderson: "Good night here in Houston, I ended up with a win. I had a kind of weird heat race but practice was good and the main was good and I'm leaving with some valuable points." After Ivan Tedesco's big crash a couple weeks ago, the team decided to have Cole Thompson park his KTM 250 and hop on the 350 to fill in. It made perfect sense since he is already a part of the team and Ivan was unable to race. Things didn't go well for Cole however, when he went down in the first turn of his semi. It appeared to be no more than a simple tip over, and the expectation was for him to jump right up. When he crawled off the track over a tuff block, it was evident that things were much worse. Sometimes it doesn't take much and you land with weight on a joint just right. Thompson felt as if his knee popped out of socket and was clearly in a lot of pain. He could not continue and his night was done. Cole Thompson: "My day started off really good and I felt awesome being back on the 350. I was getting comfortable and confident with everything in practice. Heading into the night show, I was ready to get some good starts and put myself into the main. I felt a little nervous in my heat race but built some confidence going into the semi. Unfortunately going into turn one, I washed out and caught my knee wrong ending my night. I go for an MRI this week and hopefully all goes well so I can finish out the East Coast 250 Series." Davi Millsaps was also on site to do some commentating on Supercross Live as well as some announcing from the floor with Kevin Windham. Millsaps has now been back on the bike for 3 weeks. He will certainly be ready to line up when the outdoor series starts at Glen Helen in May but there is still hope that he might make an SX or 2. The series now heads to Seattle, WA in the Pacific NW. The track is typically soft and rutted which will play into Anderson's hand as he excels in those conditions. The team will have to decide what to do in the 450 class. Whether it be Thompson or Tedesco healthy enough to return, only time will tell during this upcoming week. 1. Ryan Villopoto 293 pts. 2. James Stewart 248 pts. 3. Ryan Dungey 247 pts. 4. Ken Roczen 235 pts. 5. Justin Barcia 198 pts. 6. Justin Brayton 196 pts. 7. Andrew Short 181 pts. 8. Broc Tickle 126 pts. 9. Wil Hahn 122 pts. 1. Jason Anderson 156 pts. 2. Cole Seely 145 pts. 3. Dean Wilson 120 pts. 4. Justin Hill 119 pts. 5. Malcolm Stewart 109 pts. 6. Cooper Webb 107 pts. 7. Jessy Nelson 87 pts. 8. Zach Osborne 85 pts. 9. Shane McElrath 85 pts. 10. Dean Ferris 63 pts.